Lulu, being the youngest of the group, is a rather spoiled girl. 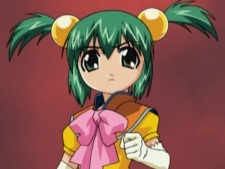 Her hairstyle and pigtail holders represent a frog's skin and eyes. Lulu died of being too cold, so she is afraid of cold stuff, gaining Cryophobia; a fear of ice or cold temperature, and Frigophobia; a fear of cold objects. Her spoiled behavior has earned her the ire of Gou and Gai whenever she does something that contradicts their activities (in Gou's case, she insisted Gorō read her a story when he hadn't eaten breakfast and in Gai's, she changed the channel while he was watching an anime), to which she replies that she only obeys Gorō which causes them to break into fits which prompts at least Shin to restrain them. Lulu is in the junior rank. Her name means Pearl. Her color image is yellow-green.